​Royal Gorge Cabins is located just far enough in the Rocky Mountains to offer an authentic Colorado experience, yet close to a variety of exciting outdoor adventures and attractions. 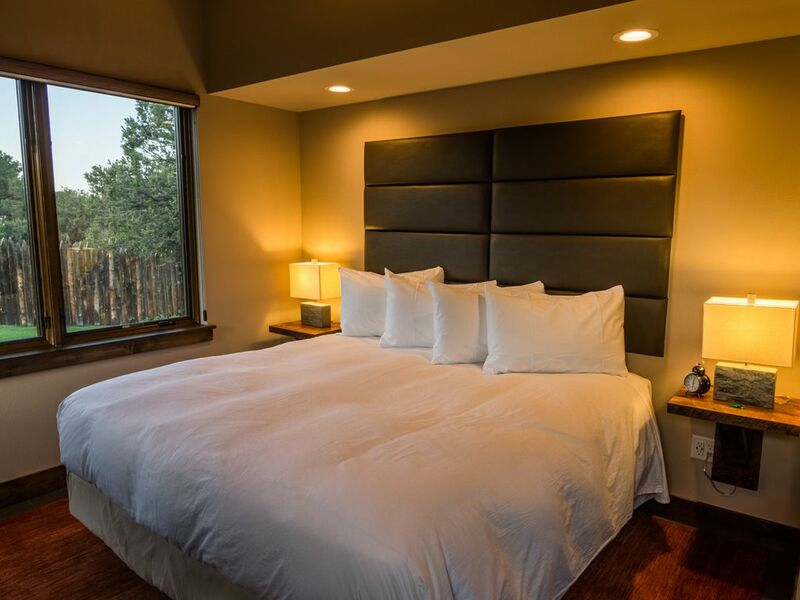 Located just one hour from Colorado Springs and minutes outside of Cañon City, the focus of our cabins is on providing you a one-of-a-kind lodging experience. Our Double King Cabin features 2 bedrooms each with a king bed and flat screen TV with cable. The full sized bathroom has a spa-style rain shower head and floor to ceiling tile. The half bathroom is just off the second story bedroom. The kitchen includes a refrigerator and freezer, sink, microwave, two burner stove and coffee maker with complimentary coffee. The living room has a sofa, large screen TV, as well as a gas fireplace that can be enjoyed from inside or outside on the private patio. The Double King Cabin has a maximum occupancy of 4 guests. Kitchen includes a refrigerator/freezer, sink, microwave, 2 burner range, plates, cups, silverware for 4 guests. Outdoor dining table. Indoor granite counter with seating for 2. Very convenient to town, the Gorge, and outdoor activities, this cabin is modern, very comfortable, and seems secluded with lovely views from the patio. The indoor/outdoor fireplace is lovely and welcoming. Small kitchen is just fine for a short stay and simple cooking (no oven), but the place is so convenient to town, going out is easy and worth it to experience the town. One thing is, VRBO will not give you entry code or your specific unit. You'll have to stop in the office to pick up your info and register. Not a problem but I didn't realize it, so was kind of nervous that I received no info. Only nits are that it is a bit bright at night because the lights outside do not dim or go out (at least as far as I could tell). All in all, we loved the place and would return to enjoy it again.